What if Your Church Disappeared? I’ve heard this question asked before numerous times. The follow up question is this: “Would the world know it was gone? Would the community miss it?” While I’m sure plenty of ‘good’ stuff happens on a weekend at many churches, I think the most honest answer for most of these same churches would be: “No and no.” That is to say, the community has not been radically altered because of the dedication and commitment of the members of said church. The world has not been influenced in the least because the Christians coming out of our churches are so radically different than the world. So, what if your church disappeared? Any considerable, noteworthy reason for panic on behalf of the people around the community, city, world? What if Christians agreed to not Kill Each Other? The whole just war/pacifist debate has been raging, even if under the radar, for centuries. I don’t really know where I stand in great detail at this point. I do think, however, the world is quick to go to war. As a follower of Christ, this is unsettling. As a follower of Christ, I read a lot about peace from the life and ministry of Jesus. When it comes to questions of when war is justifiable and what role Christians should have in military, I’m not prepared necessarily to address just yet. But what I can say with confidence, and with all seriousness, is in the form of a ‘what if.’ What if, at the very least, Christians agreed we wouldn’t kill each other? Now this may sound like a given, like an unnecessary message. But is it? If one says, “Of course we won’t kill each other!” How does one know if the other is a Christian? You’re smart enough to see the far-reaching implications of this proposal. I won’t spend time fleshing these out. 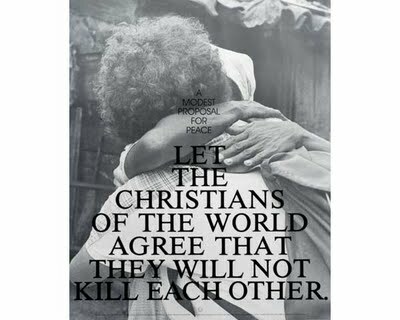 But I’ll leave you with the ‘what if’…what if Christians agreed to not kill each other? Would that make a dent in the violence we see all around us? Would it make a dent in the violence we see within ourselves?